A patient falls on an outstretched arm and experiences a painful shoulder. 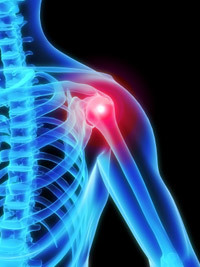 The individual seeks assessment from an orthopedic surgeon because of pain in, and limited motion of the shoulder. The X-ray is compatible with minimal arthritic changes in the acromio-clavicular joint and a very normal gleno-humeral joint. There is pain with shoulder elevation so the orthopedic surgeon cannot determine if the limitation is due to a rotator cuff tear or pain. In addition, you have had some recent discomfort in your same upper arm, intermittent for several months. A Magnetic Resonance Image is requested and is interpreted as “a partial tear” of the rotator cuff. How should you be managed? In an initiative to optimize skeletomuscular care, The American Academy of Orthopedic Surgeons has established work groups to perform systematic reviews of scientific publications on a particular subject and establish clinical guidelines as to the best methods of care. It is part of the evolution in clinical care from opinion alone as to how a patient is treated to scientific evidence based practice. Musculoskeletal care is many different things and practiced in varying settings and geography. In an effort to standardize and optimize quality and efficiency, the guidelines are being created.